patent publication numbers: patent numbers from supported authorities can go to a variety of public and commercial patent sites. These features are supported in both BizInt Smart Charts for Patents and BizInt Smart Charts Drug Development Suite. Note that these "full-text links" are different from both the links to records on publisher websites which are associated with each row in the chart and the links from titles to records created by BizInt Smart Charts. First, identify a column which has publication numbers. 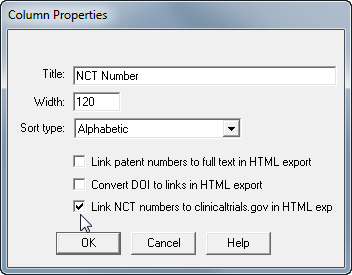 Examples are "NCT Number", "Patent Family", "US Patent Number", "DOI Number" and "Trial Identifier." This column must be visible in your chart. Open the View | Column Properties panel for the column and check the option for your desired links. Note: the link options are not selected by default but will be saved in templates you create. DOI numbers: On the Options | DOI numbers panel, the default is to use https://doi.org/ as the link resolver. If you want to use your corporate link resolver, look at an existing URL and enter everything before the "10.". Patent publication numbers: On the Options | Full-text patent links panel, select which service to use for each supported authority. Note: These settings apply to all charts and all columns. 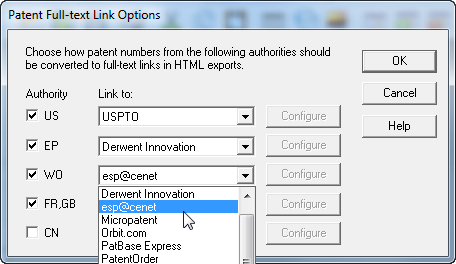 If you are using PatentOrder, you may need to configure your base URL in order for the full text links to work properly. To do this, press the Configure button next to one of the authorities. You only need to configure PatentOrder Direct for a single authority. The setting will apply to all authorities. The full-text links are visible in one of the HTML export formats. Use File | Export to export your report to HTML, Word, Excel or Acrobat. Remember that patent links will only be visible for the supported authorities. Depending on the platform, a userid/password could be required to follow some links.